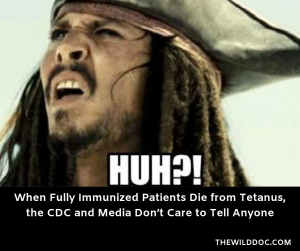 When Fully Immunized Patient’s Die from Tetanus, the CDC and Media Don’t Care To Tell Anyone. 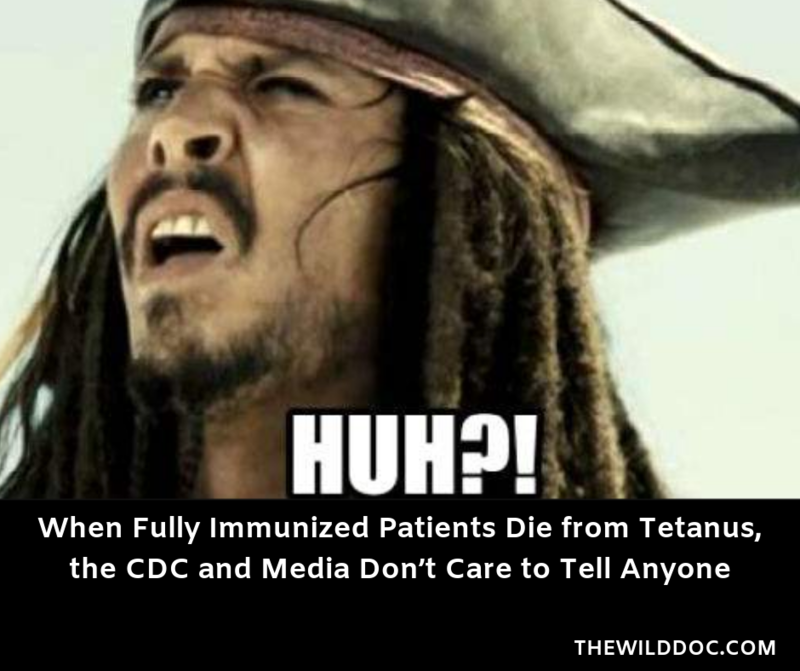 The Pharma Media and CDC have gone crazy over the case of a 6-year-old boy who suffered from what was clinically diagnosed as “tetanus.” This boy’s unlucky bout with a serious health crisis has been used to further promote the Pharma/Vaccination agenda. The internet and news channels were filled with titles like: “Unvaccinated Oregon Boy, 6, Almost Dies of Tetanus” and “An Unvaccinated Boy Got Tetanus. His Oregon Hospital Stay: 57 Days and $800,000.” Articles such as these lead us all to believe that the vaccine would have prevented this event from ever happening. But is this really the case? While the Pharma front group, CDC, will take any unfortunate opportunity such as this to point the finger at those who chose to forgo Big Pharma’s cash cow (Vacca), and say “look, look, everyone, an unvaccinated child has gotten sick,” all the while remaining silent when those who are vaccinated are sickened by the illnesses their precious vaccines are supposed to protect them from. In fact, it is well documented that the tetanus vaccine was not the major cause of the decline in tetanus cases or even the death rates from tetanus. Peer-reviewed scientific publications and even morbidity and mortality data from the CDC itself shows us that the vaccines really don’t seem to protect all that well. Shoot, even the “hyper-immunized” and fully vaccinated are still getting tetanus and even dying from it. That’s right folks, someone who was vaccinated more than anyone in our society can even become severely ill! But it doesn’t seem the CDC really cares to publicize that fact! It wouldn’t fit their agenda or please their ruler, Big Pharma. The vaccine didn’t cause the decline of this illness and being vaccinated against tetanus doesn’t mean you are protected. It’s time the full truth was told to everyone. Please share this with everyone you can! Let’s make sure people know what the CDC doesn’t believe we deserve to be told. As a side note, I do want to say thank you to all the very caring and knowledgeable doctors and medical staff that helped to save this child’s life. That is what medicine is supposed to be about. I always say that America has some of the finest and best emergency medical physicians, granted they have the most practice. Given that America, despite being the most highly vaccinated and drugged society in the world, we have the worst overall health outcomes for our children and adults. An Unvaccinated Boy Got Tetanus. His Oregon Hospital Stay: 57 Days and $800,000. Severe tetanus in immunized patients with high anti-tetanus titers. “Distinguished” UCLA Professor Admits, Vaccinated People Contract and Spread Whooping Cough More! Public Health Officials Testify (FALSELY) On Measles Outbreak!